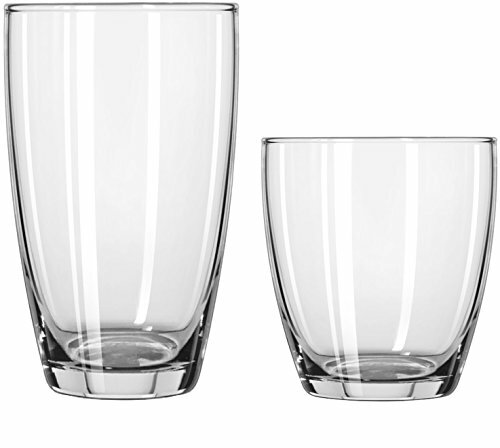 Enjoy your Beverage with full Satisfaction the glasses does not contain any harmful chemicals such as BPA, phthalate, PVC, or polycarbonate, so nothing can leach into your Beverage from the glass. Made of glass enabling the color of the Beverage to shine. Elegant look and adds to any table's aesthetics with their contemporary design. Increase the overall drinking experience and is strongly recommended by health experts. Shaped to perfection the glasses are shaped to perfection with breakthrough styling and unmatched brand value. The unique glass shape enhances the juice and liquors aromas and flavors. It increases the overall drinking experience and is strongly recommended by experts. Has an elegant look in a wine cabinet and adds to any table's aesthetics with its contemporary design. Shaped to be an all-purpose glass the base of this glass provides maximum stability. Ideal for juice and all beverages as well. Breakthrough styling and unmatched brand value. Unique glass shape enhances the juices aromas and flavors. Preserves and presents flavor exactly as intended. Made of clear glass enabling the color of the Beverage to shine. Elegant look in a wine cabinet and adds to any table's aesthetics with their contemporary design. Increase the overall drinking experience and is strongly recommended by experts around the globe. At almost every special occasion, people choose to share a drink. How would you like having a glass set that feature a unique design and provide you with incomparable flavor Satisfaction? these amazing glasses are ideal for all beverages as well. They feature a shape that enhances your drinks aromas and flavors. What is more, their base provide maximum stability that will add to your table's aesthetics with their contemporary design. Recommended uses: these are perfect party decorations. Depending on the theme you will find use for them. They make great gifts for any occasion. These are perfect for: Christmas, birthday gifts, wedding party, your best selling Beverage, Valentine's day, anniversary, Father's day, Mother's day, housewarming, cyber monday and black Friday sale gifts, new years, college graduation, St. Patrick's day, Congratulations, job Promotion, stocking stuffers and secret Santa gifts! Glass is the only packaging material generally regarded as safe by the U.S. Food & Drug Administration. Glass is made from all-natural, sustainable Raw materials, is 100% recyclable, and can be recycled endlessly with no loss in quality or purity. Glass fixes the problem of keeping the outside out while simultaneously letting you rest at ease knowing that with every sip from your bottle, you're just drinking the water and not the bottle! Color old beach pilsner, red ball dessert Canister, clear tall, buffet casserole, colored, Honey, soap, tumbler, Bee crystal mystic gold cup, classic personalized embossed large lead free entertaining piece amber columns theory flavor hermetic beverages edition classics, funny craft black cyber, mini Italian cut DOF, tempered bakeware, vase, pots, locking serveware, white cappuccino stout pourer, small cold Shaker, rainbow borosilicate, two moonshine Editions, all new quart tray glass cups. If you have any questions about this product by Circleware, contact us by completing and submitting the form below. If you are looking for a specif part number, please include it with your message.